LENTZ RESURGENT GRAINS feature Lentz Einkorn Farro, our signature crop. Einkorn, Triticum monoccocum, in its wild form Triticum boeticum, is the most ancient cereal grain, a million years old according to USDA research. 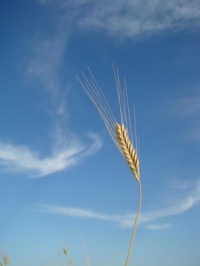 Einkorn is a German word meaning One-Kernel, a reference to the single grain per spikelet on the head of the plant. It’s a diploid with 14 chromosomes. The Karacadag mountains (Deer Mountain) of Turkey are Einkorn’s region of origin. Archeological evidence shows that wandering tribes relied on Einkorn for food as far back as 17,000 years ago. 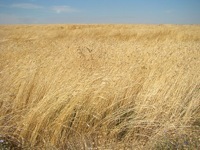 Together with Emmer, Einkorn was domesticated at the dawn of agriculture in the Fertile Crescent, which domestication initially was the selection of non-shattering strains of the grain. 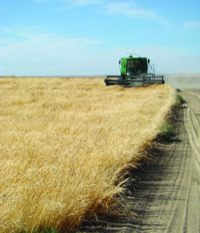 Later Einkorn spread together with Camelina into Europe where it also played a key role during the beginnings of farming. Ötzi the Iceman, that famous Copper Age traveler found in an Alpine Glacier, had Einkorn for his last meal and also carried some of the grain on him. 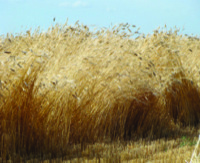 When durum, Spelt and hexaploid wheats found increasingly favor with farmers, Einkorn was raised as a minor crop, except in marginally fertile regions where it remained important due to its superior survival aspects. More recently, industrialization had little use for hulled-grain Einkorn, and the ancient landraces disappeared almost entirely. Einkorn’s resurgence began in Italy as part of the backlash against the industrialized food system and its accompanying environmental and human health problems. The rise of the Slow Food organization is emblematic of the resurgence that soon spread to Central Europe – today you can find Einkorn in Austria, France, Germany and Britain, grown as specialty crop. Lentz Einkorn Farro traces back to a few grams of seed at the USDA-ARS National Small Grains Germplasm Research Facility in Aberdeen, Idaho, from where a Montana researcher obtained germplasm – “a mixed population of landrace accessions.” He intended to include this Einkorn in his hulled-grain project, but discontinued that part of the research, passing on to us a little of the seed. Those few kernels were the beginning of seven years of plot work, as we increased the seed by tedious hand work until, as far as we know, we were the first in the U.S. to farm sizeable fields of Einkorn with grain drill and combine. Due to shifts in subpopulations within a landrace, a variety acquires distinct traits in particular environments, in our case the Columbia Plateau: Lentz Einkorn Farro is an Einkorn unique. Chefs and bakers delight in our Einkorn, and in addition to its great taste, Einkorn ranks first among cereals in antioxidant levels, and tests high in vitamins and minerals as well.